Although no one was killed, the Battle of Golden Hill was the first significant clash between citizens and British troops as the colonies moved toward revolution. 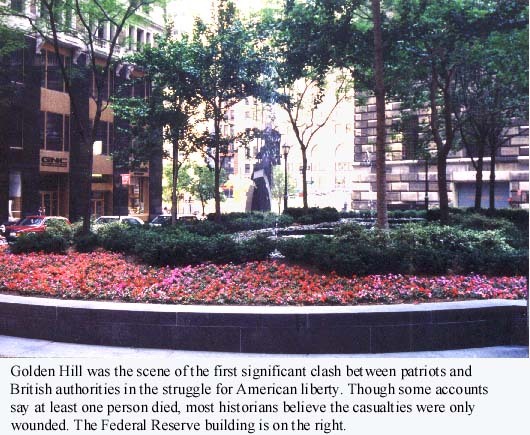 Several New Yorkers had been wounded in a similar confrontation three years earlier, but Golden Hill was a more direct challenge to the British and the wounds suffered by the patriots were more severe. 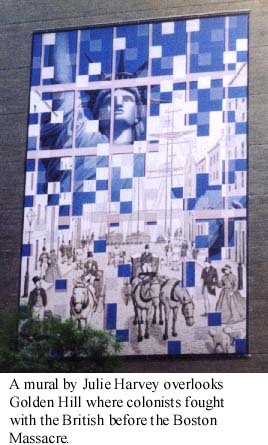 As opposition to the Townshend Acts grew in the colonies, the Sons of Liberty erected a Liberty Pole in what is now City Hall Park to show their defiance to British opression. On Jan. 13, 1769.British troops tried unsuccessfully to blow up the pole. They returned to the area to destroy the pole on Jan. 17. On the 18th, 3,000 citizens gathered and declared all soldiers found armed in the streets were "enemies to the peace of the city." A committee of Sons of Liberty was appointed to enforce the action. Soldiers retaliated by posting placards ridiculing the citizens. Three soldiers caught posting placards were marched toward the mayor's office when 20 British soldiers met the party and tried to rescue their colleagues. More citizens arrived and fighting broke out. The soldiers were forced to retreat to the east toward Golden Hill. 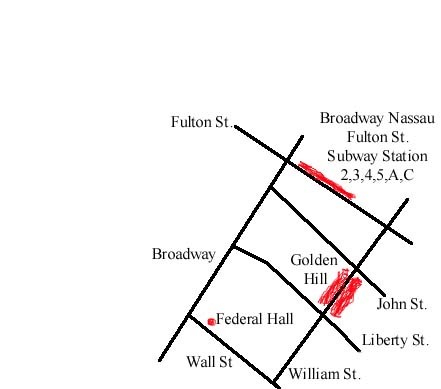 The area is now bounded by John, William, Fulton and Cliff streets. The soldiers were reinforced and fighting broke out again. The soldiers charged the citizens with bayonetts, and several were wounded. Officers arrived to order the troops to their barracks. Though some reports at the time said that one American was killed, historians now agree that none of the wounds were mortal. This incident preceded the Boston Massacre by more than a year. Address: William Street, from Liberty Street to John Street.